Picture of the Week ~ Fullsteam! This week’s picture was taken in Durham while enjoying a nice cold pint of Fullsteam’s Rocket Science IPA. On this particular evening the Will & Pops food truck made a very welcome Monday night visit. Fullsteam offers a great selection of beers that “celebrate the culinary and agricultural heritage of the South”. They also have guest taps offering a few beers from other local Triangle breweries. Since Opening last August, their family friendly tavern at the brewery has become a favorite location for community events. 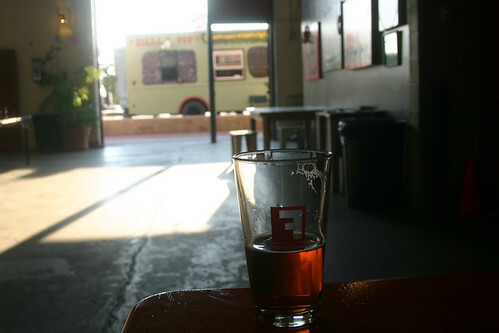 You can typically find one or more of the popular local food trucks parked outside the brewery on any given evening. Check out their website for more info about their beer making philosophy and get the latest news on events and food trucks scheduled.